Diana Butler Bass admits she’s not good at gratitude. She has trouble with keeping a gratitude journal, and she struggles writing thank-you notes. Her own personal difficulty with gratitude, as well as her long-standing interest in spiritual practices, prompted her to delve more deeply into the notion of gratitude. What she found as she researched her new book, “Grateful: The Transformative Power of Giving Thanks,” was that gratitude is not just a private feeling but is also inherently social, connecting us as individuals with others. If we can practice radical gratitude, and stop conceiving of gratitude as transactional, she said, we can change ourselves and society. “There’s a different way to live that’s really possible. And I think that gratitude is one of the gateways into that world,” she said. Bass is a writer, speaker and scholar of American religion and the author of 10 books, including “Grounded” and “Christianity After Religion.” She has a Ph.D. in religious studies from Duke University. She spoke to Faith & Leadership about her new book and the many layers of gratitude. The following is an edited transcript. Q: You write about some really difficult things in your own life -- about abuse, about losing a job. So where is gratitude in that? 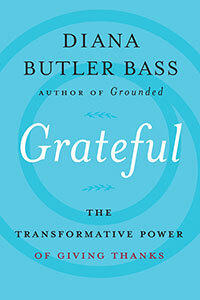 The book unpacks two levels of gratitude that are very important for us to grasp. One is the simple burst of thankfulness that comes with seeing a beautiful sunset or -- I tell a story about a time my dog was lost and then was returned to me. And those kinds of things are very accessible and are deeply, deeply human. But what happens if there’s a great injustice or if you are living in a situation where there’s abuse or violence? One of the interesting things is that people who have been through great suffering and come through it have developed some level of [gratitude] that actually helped them to survive. I quote Elie Wiesel in the book, for example. Understand, Elie Wiesel is not thankful for the Holocaust. He would have rather had the Holocaust not happen. But at the same time, he talks of how, when they were in the camps, it was the people who could wake up in the morning and see the sunshine and say, “Thank God I’m alive one more day” or, “Look at how lovely that cloud is” [who were more able to carry on]. It was those people who could see through the evil and find that there was a moment of grace or the presence of wonder or a token of love even in the midst of the most horrible situations. We should never be grateful for suffering, but the truth is we can be grateful through suffering, and that little prepositional switch -- that’s where the empowerment comes. Q: You write that gratitude is a spiritual awareness and a social structure of gift and response. That’s the other key. It’s a feeling, and it’s an action. It’s personal, and it’s communal. It’s internally complex, but we also engage this process with a sort of shape or form that comes from the external world. I engage two structures in the book. One is what I call a structure of debt and duty. So we’re in debt to the benefactor until we discharge that debt. And that debt gets discharged by all kinds of things -- giving a return gift, sending a thank-you note, doing a favor in return. That cycle of reciprocity has often been structured in Western society hierarchically. You have a person who’s a benefactor, who’s richer or has resources, who then gives a benefit to people who are without the capacity to have those things themselves. Q: So it’s very transactional. It is extremely transactional. It is really a vision of exchange, and it’s almost always economically imagined. But that’s not the structure that the Bible puts on gratitude. In the Bible, it’s about abundance and table fellowship and the sharing of gifts for free without any expectation of return. One of my favorite verses in the whole of the New Testament comes from Luke, where Jesus says that when you give a dinner, don’t just invite your relatives and your rich friends in expectation that you’re creating a quid pro quo system -- he actually says that, that they’ll pay you back -- but instead, when you give a banquet, you invite the poor, the crippled, all those people who can never afford to repay you. And if you give a gift of a meal with no expectation of return, then you will be blessed. And when will you be blessed, Jesus says? Well, you’re going to be blessed with the resurrection of the righteous, but it’s going to be a really long time from now. So Jesus actually disconnects [the structure]. He literally says to invite the poor because you will not get any payback. There will be no payback; there is no quid pro quo. Jesus disconnects gifts and the giving of a meal from the possibility of payback by putting the blessing that you receive so far in the future that it becomes irrelevant to the act of giving the gift. What sense does this make? It doesn’t make any sense, because we’re so used to living in a structure of payback and return for benefit, and Jesus literally says no to that. It’s clear as day in the New Testament. That’s not the only place, but I think that’s the most obvious place. Q: You distinguish between “me” and “we” in emotions and ethics. What is the public part of gratitude? The public part of gratitude, and the communal part, was in some ways the more challenging part of the book to write. Most gratitude books are about individuals. They’re about individual feelings and individual practices. And the really good ones -- and there are a lot of very good gratitude books -- the really good ones help people move from the feelings of gratitude toward a more sustained process, an ethic, a personal ethic of gratitude. And it could be things as simple as keeping a journal and being more attentive to people around you and more intentional about appreciations and all those kinds of things that actually do migrate into doing good and attending to social justice and all that kind of stuff. But I’d never seen a gratitude book that actually then took that personal dimension and applied it to the political one. This is what’s unique about the book and also connects it to my larger work -- I care about and I have written about congregations so much. In the book, I talk about the Chicago Cubs winning the World Series -- these sorts of moments of absolute communal surprise or relief or wonder or celebration. I can imagine the end of World War II, with people flooding out into the streets of New York. We really do as a people need those places of festivity and joy and playfulness in order to have a healthy society. And that’s where I get into the external shape of gratitude. Because if gratitude is deployed as a transaction of debt and duty, then it becomes a mechanism of control to reinforce structures of injustice. There are newer forms of community around spiritual practices that understand that gratitude is not intended as a lever to promote injustice but that gratitude really is the doorway into a universe of grace and gift. Those communities have the possibility of unhinging the power structures of abuse that we’re all struggling with right now in one way or the other. There’s a different way to live that’s really possible. And I think that gratitude is one of the gateways into that world. Q: What are some of the things you would recommend for folks who want to enact this in their lives? The practices on the personal side are practices of attention. Anything that draws our eye toward where grace and gifts are present in our lives. Gratitude helps us be able to live more deeply and fully into a vision of abundance on a personal level. And so there are things that are as simple as keeping a gratitude journal. I am not very good at that. Even if I set a journal next to my bed and just say, “OK, write down three things every night that you’re grateful for,” it becomes more of a burden for me than a joy. So what I have next to my bed, actually, is I have a little stone that says “gratitude” across it. It sits right by my bedside, and every morning when I wake up and roll over to grab my cellphone, my hand lands on the stone. And also the last thing I see before I go to bed is that little rock. And so a cue prompts you toward a habit, and the more you’re cued, the more the thing becomes a habit, and then it just becomes part of you, and it becomes very natural. So I think all of that is really great stuff in terms of personal spiritual development, and anybody who knows that literature will tell you the same. The more difficult piece is how we do that communally. This is a place for churches that I think is really tricky. We assume that we’re communities of gratitude, but often, we’re not. Often, gratitude is structured in congregations as quid pro quo and not generosity. And I know this from my own personal experience, and I know it through years and years and years and years of studying congregations. Every single pastor, every single lay leader I know has had this experience a multitude of times. People in churches use gifts as a way of controlling communities. That is not generosity; that is turning gifts into a mechanism of oppression. And until we get over the idea that our giving is really just another way of trying to control the universe in which we live -- that it is transactional and economic -- churches cannot be the kind of iconic community of gratitude that’s envisioned by the New Testament. Our stewardship practices are central to this; I get why people do it, but every time there’s a stewardship campaign where they say, “If you give $500 a year, then you’re an ‘Angel’ giver and we’re going to put your name in the bulletin,” that’s transactional. What we really have to do in congregations is to move in the direction of the New Testament. That when you give a gift, you don’t give it with any expectation of anything in return. It’s very hard for people to live into that, but that’s what the whole theology of grace is. Part of my dream in writing this book is to help people in congregations get to levels of gratitude that they never thought about before. I would love to see churches actually live that way, and if we can live that way, then we become models for how that can happen in other places as well.